I have gone back and forth on posting this. I sometimes think I shouldn't, but then I go right back to thinking I should. I have a lot to say, and it's all incendiary. Sometimes I write something and I'm like no, that's too harsh. Other times it's not harsh enough. Basically, the Nintendo Switch makes me so incredibly, incredibly angry, and I have a lot of thoughts on the matter. 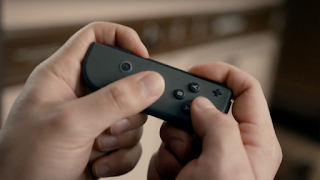 If you're a fan of the Nintendo Switch or even probably just Nintendo in general, this article will probably make you angry. Enjoy! First of all, before you start thinking I'm just some kid who didn't grow up with Nintendo and that's why I don't "get" it, pump the brakes. I did grow up with Nintendo. I'm 36 years old and Nintendo made the console that got me into video games, so don't think I'm completely anti-Nintendo. I am, however, anti this abominable little device. If you like the Switch, great. I don't have any idea why you like the Switch, but great. Good for you, you magnificent fool. I don't care to know your reasons why you like it, because you're not going to change my mind about it. It's the same reason why I'm not going to change your mind on why this console is absolutely, unequivocally terrible if you're already a fan of it. So let's jump right in! 1-2-Switch, Just Dance 2017, The Legend of Zelda: Breath of the Wild, Skylanders Imaginators, and Super Bomberman R. This was the launch lineup for the Switch. There's one game out of that list that is worthwhile, and it's available on the Wii U which, if you're a Nintendo fan or a Zelda fan, you probably already have. I look at this list, and I can't wrap my mind around why anyone would be excited for this. This is what people were lined up at launch to choose from? Actually, they just chose Zelda as everything else is garbage or staggeringly mediocre. But I saw people making videos where they're legit excited about getting the Switch and I just... I can't fathom how someone could be remotely excited about this thing. A few more games have been released for the Switch since then. I have now seen Mario Kart 8 Deluxe, Puyo Puyo Tetris, Lego City Undercover, and The Binding of Isaac. With that, let's look at this a bit closer. There you go! There's so much there to sink your teeth into. If you're into Nintendo games, the chances are great that you already have a Wii U. If you already have a Wii U, what's the draw for the Switch? It's certainly not its incredible lineup of software, most of which is already available on the Wii U. It's definitely not the power of the system, because I haven't seen a single thing on Switch that I thought couldn't be done on Wii U. And if you somehow don't own a Wii U but are interested in the Switch, then what the hell is wrong with you? The Wii U came out in November of 2012. You're telling me that in 4+ years you never saw enough on that system to pull the trigger, but you're already on board with the Switch? With its abysmal library of games, all of which save maybe three are also available on the Wii U? Sony and Microsoft can get away with the promise of things to come, as their track record shows it to be true. No one for a second thought, "Man, I don't know if PlayStation 4 is going to have a steady stream of good games. Xbox One, too. We might be stuck playing Knack and Ryse forever." However, right out of the gate, you have to wonder about Nintendo. Super Nintendo was the last time they were unquestionably on top. Don't tell me that Nintendo 64 was the best of its generation because it wasn't. Just because you liked Ocarina of Time and Goldeneye doesn't excuse the fact that the PlayStation was the superior console. I barely even had a PlayStation and I definitely knew at the time I was getting shafted. GameCube couldn't touch PlayStation 2. Wii was vastly inferior to Xbox 360. Just because each one had some good games on it doesn't mean that it was better than the competition, because it wasn't. Now the Switch is going up against PlayStation 4 and Xbox One looking like last gen hardware with a gimmick controller. The last gen offering also having a gimmick controller, mind you. As did the one before. Truly a game designed for portable play. And what's coming out in the future? Skyrim? Skyrim came out in 2011. 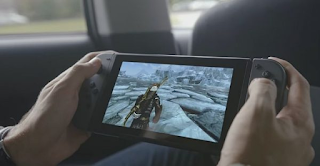 How could anyone be excited about playing Skyrim on the Switch in 2017? Is it even the special edition that was released last holiday on PlayStation 4 and Xbox One? Anyone that has wanted to play Skyrim has played it already. Who has been holding out on Skyrim so they can play it on the Switch? Anyone? Then you have Ultra Street Fighter II: The Final Challengers looking like an enhanced port of Super Street Fighter II Turbo HD Remix that came out on PlayStation 3 and Xbox 360 in 2008. And of course there's Disgaea 5 Complete, a "complete" version of a game that came out on PlayStation 4 in 2015. Get excited, everyone. Nintendo has been behind the competition for two decades. Almost deliberately so, it seems. When GameCube came out, people were excited because the games were now on discs. That shouldn't have been impressive; that was the standard. Then when Wii U came out, people were excited that the games were now in HD. Again, that wasn't impressive; that was the standard. Xbox 360 and PlayStation 3 were coming out and Nintendo was putting out a standard definition console on par with the previous generation. Now, again, PlayStation 4 and Xbox One are wowing people with incredible visuals and Nintendo is trotting out games that look like nothing the Wii U couldn't handle. "Quality over quantity," the apologetic battle cry of the Nintendo fan, is still being used to this day. But why? What quality? Not everything Nintendo touches is gold. Nintendo putting their spin on something doesn't make it good. They're extremely stubborn and out of touch. Nintendo fans are the worst. They complain about other systems with their annual sequels but then enthusiastically snap up the latest Mario game like it's some fresh new game that's going to change the way you think about video games. Do I hate Mario? No, in fact Super Mario 3D World is one of my favorite games this generation. But I can't sit here and pretend like Mario hasn't been doing the same thing since his inception back in the 80s. Same with the Legend of Zelda, though I find its formula extremely tiring at this point and couldn't possibly care less about the latest by-the-numbers entry in the series. I've literally heard people say, "Breath of the Wild is the best Zelda game in the series." It is way too early to say things like that. I don't see people playing Breath of the Wild 25 years from now like they do A Link to the Past. How many times do Nintendo fans have to be burned before they give up on them? Why do they keep blindly coming back? Because they want to keep playing Zelda? Nintendo going third party would benefit everyone. I'd love to see Nintendo get out of the hardware business because clearly they have no idea what they're doing anymore. [There's the part where the Nintendo apologist chimes in with sales figures and says that Nintendo clearly does know what they're doing.] Their games aren't good enough for me to invest in their crap underpowered hardware with their new wonky controller. Sega did it a long time ago. It's well past time for Nintendo to bow out. Unless people want to spend $300 on a console with a handful of games and nothing AAA that is multi-platform on PlayStation and Xbox. I feel bad for anyone who just owns a Nintendo system. In conclusion, basically, if you currently want this thing I think you're an idiot. * The Legend of Zelda: Breath of the Wild screenshots from GameFAQs users KFHEWUI and TeraPatrick2008. ** Mario Kart 8 screenshots from GameFAQs users Tails 64 and Dugger1981.